This image is courtesy of Diana Brown earlier this week. Another week has rolled on by so very quickly. Considering the tenor of this weeks posts/rants/ravings in regards to the budget [still another post on that to come] I felt that this little gem was the perfect way to slide from the political slime and into the silly. Now everyone out there remember to have your sillies, satires and sallies ready for this weekend challenge. The rules haven’t changed you just need to respond one of the Humor posts here or at another participants site and include the URL From the Weekend Funny Challenge Page in your own humorous offering in this weekends walk with the wacky. I’m looking forward to seeing what everyone comes up with this weekend. So dig out the funny bone, see if it still has some life left in it after the working week and remember the song by the Easybeats – Friday on My Mind. This is actually the first time I’ve heard the Easybeats. Were they popular in North America? Love the Cat in the Hat. Hilarious! Not sure about where they had a big following but I think they 2 or 3 big hits apart from this one which has stood the test of time. Love the Dr Seuss! Should be published front and centre on every newpaper and news site! Does have a ring to it doesn’t it :). Dr. Seuss poem worthy of poster format! 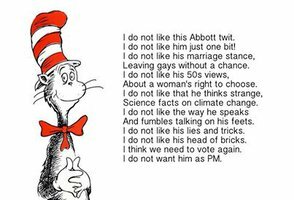 Love it all – Dr Seuss and Easybeats.